The service is accessed through a mini-program within WeChat — the Tencent-owned messaging platform Walmart partnered with earlier this year in order to better reach its Chinese customers. The retailer hasn’t made a formal announcement about the same-day grocery delivery because the service is being tested while Walmart collects customer feedback. However, there is signage in the store that informs customers about the option. Customers near Walmart’s Xiangmihu store can now have groceries delivered to their doorsteps within one hour. 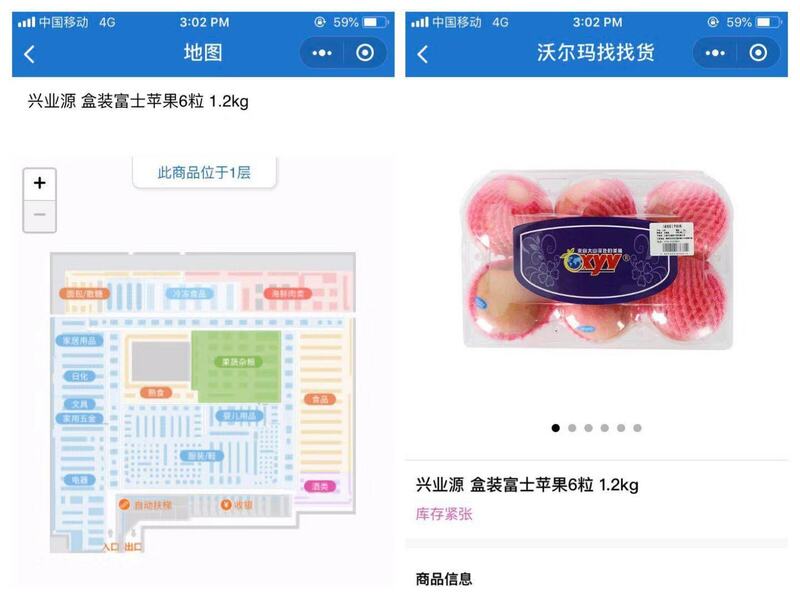 The test is taking place in the main Walmart WeChat mini-program, and appears when you select the store where the delivery service is enabled. The feature allows Walmart’s WeChat customers to place orders on mobile and then receive delivery in as little as one hour. Nearly 8,000 SKUs are available on the service, Walmart says, including fresh products, condiments, snacks, baby items, personal care items, homecare items, a range of products from Walmart’s private brand Great Value and Walmart’s Direct Import products sourced from around the world. In addition, customers who shop in the store using Walmart’s Scan and Go for quick checkout can now easily re-order those items from home through the service. Though the deliveries are provided by Dada, the new Walmart to Go service is not directly related to the recent investment that JD.com and Walmart jointly made to deepen JD’s “borderless retail” strategy that blends online and offline shopping, the company clarified with TechCrunch. 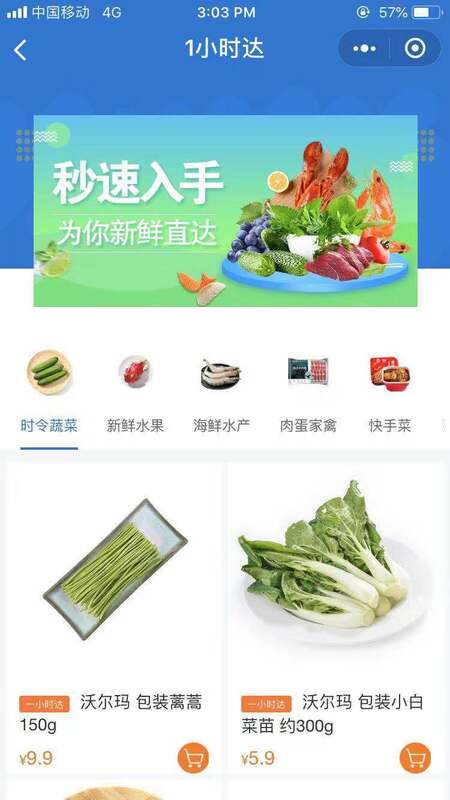 In August, the Alibaba archrival and Walmart poured $500 million into Dada-JD Daojia, which is part-owned by JD and offers same-hour grocery delivery across 63 Chinese cities. JD and Walmart’s tie-up dates back to 2016, when the Chinese online retailer scooped up the American firm’s Chinese e-commerce marketplace Yihaodian. However, Walmart To Go is another of Walmart’s ominchannel initiatives — this one, focused on personalizing the shopping experience for the customer by way of product recommendations and coupons customized to the individual user. Explained a company rep, Walmart to Go is just one more channel to serve customers shopping through the WeChat mini-programs. At TechCrunch Shenzhen, Walmart’s senior director of e-commerce in China, Ted Hopkins, confirmed the test being advertised in the Walmart Xiangmihu store (or known to Shenzhen customers as 沃尔玛 香蜜湖店) is brand-new. It’s been operating for about a week, he said, and invited the event attendees to go check it out and offer feedback. The store is located near Walmart’s offices in the city, which could be why it’s the first to launch the service. It’s also the first to test Walmart’s new mini-program that allows in-store shoppers to access a digital map that shows the location and stock status of store inventory. The mini-program helps customers locate where these apples are in the store. Walmart has been working on integrations with WeChat since the beginning of the year, then began scaling the programs in earnest in late March to early April 2018. It rolled out its Scan-and-Go technology, which allows Chinese shoppers to scan items in their shopping cart, then pay using a program within WeChat. In a five-month period, Walmart scaled this from 10 stores to more than 400 stores. Walmart’s tie-up with WeChat appears as a logical move as its ally JD.com counts Tencent as a major shareholder. Meanwhile, Alibaba’s e-commerce platforms, including Tmall and Taobao, are noticeably absent within WeChat, as links to these services are blocked on China’s biggest messaging app. Since becoming an option within WeChat through the platform’s mini-programs, customers are adopting this sort of digital payment method at scale. Its best performing store has over 40 percent order penetration, Hopkins noted.